Softball and Baseball games at SCF are cancelled for tonight. The games against SCF at Unity on 4-29-19 will now be a Double Header(2-5 inning games) starting at 4:00pm. **CANCELLATION** Baseball @Shell Lake has been cancelled for tonight (4/1) . Softball has been moved to home @5pm. **CANCELLATION** Baseball tonight (3/29) at Cumberland has been cancelled. #OpeningDay! Softball season kicks off this afternoon with a home game vs. Cumberland. Stop by and cheer on your Unity Eagles! First pitch is at 5pm! National Honor Society Banquet, Thursday, March 28th at 7pm in the PAC. SAM: Stop Abusive Text Messaging community presentation, Wednesday, March 27th at 7pm in the PAC. Boys Basketball Banquet, Tuesday, March 26th at 6-7:30pm in the Elementary Cafeteria. Golf Parent meeting Tuesday, March 26th from 6pm - 7pm in the Library. 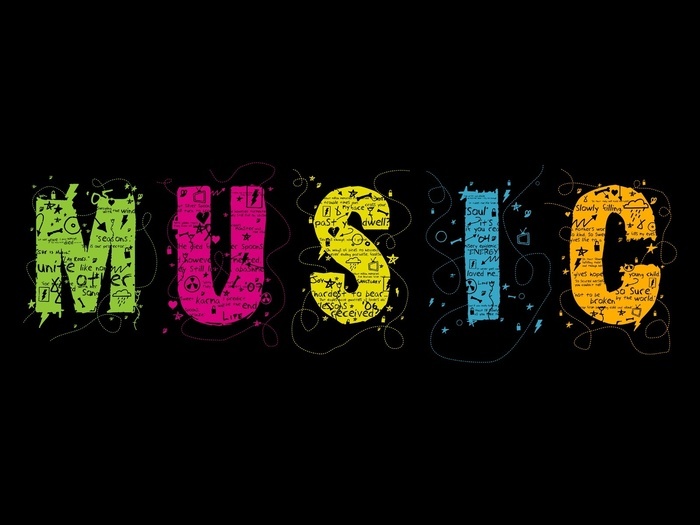 Celebrate music this week at Unity School District! High School Large Group Music Contest will perform for the community from 4pm to 8pm Tuesday, March 26th in the PAC and the High School Gym! New Performances every half hour! 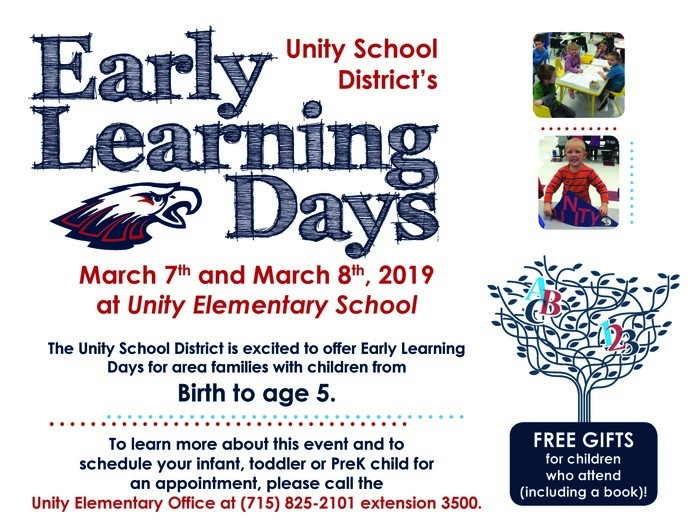 One last day to sign up for the Unity Elementary Early Learning Days! Birth to 3 screenings available too! Call the Elementary Office to reserve your time slot! Unity Early Learning Days is March 7th and 8th! Call the Elementary office to reserve your time slot! 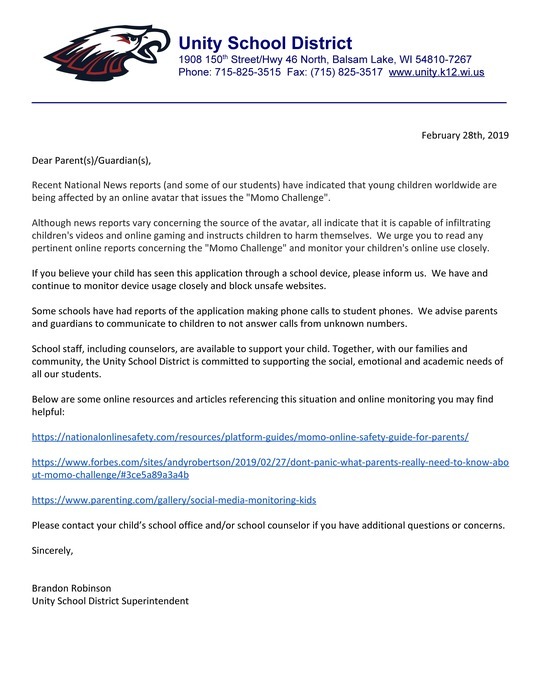 Due to poor road conditions coupled with cold temperatures, Unity School District is delayed two hours tomorrow, February 25th. Stop by Unity High School to cheer on the Girls and Boys Basketball teams TONIGHT!!! Games begin at 5:45! Due to inclement weather and poor road conditions, Unity School District is closed today, February 12th. All activities and events are canceled. Due to poor road conditions and inclement weather, Unity School District is delayed two hours today, Friday, February 8th. Due to inclement weather and poor road conditions, Unity School District is closing early at 1:30pm today. There will be no evening events or activities. *Cancellation* Tonight's basketball doubleheader @Cameron has been cancelled. 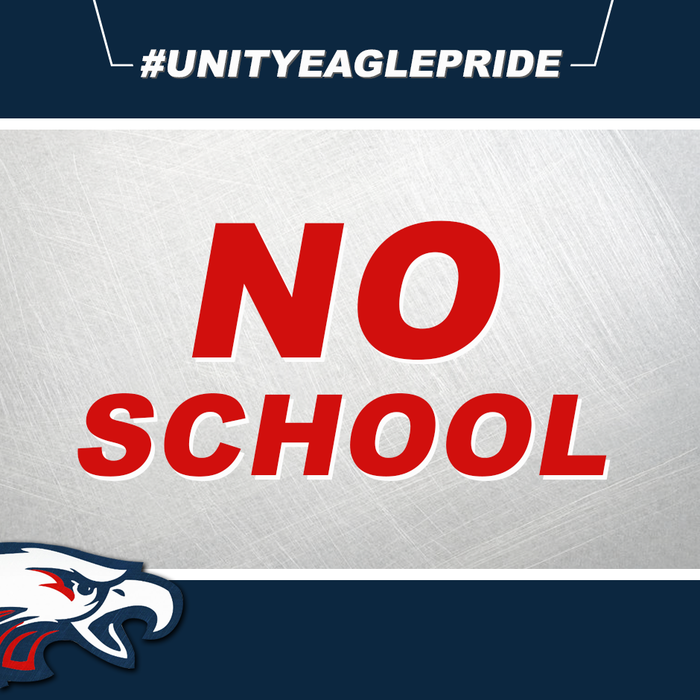 Unity School District is closed today, Monday, February 4th, due to poor road conditions and inclement weather. The Polk County Sheriff's Department has also advised no travel due to icy roads. All activities and events are canceled. Have a good and safe day. Leadership, character, and hard work are the very traits that will support the incredible efforts of these Unity FBLA students as they head to the Regional Leadership Conference in Superior, WI. Good luck to everyone and thank you for representing Unity School District! Due to inclement weather, Unity School District will be closed Tuesday January 29th and Wednesday January 30th. There will be no after-school activities. 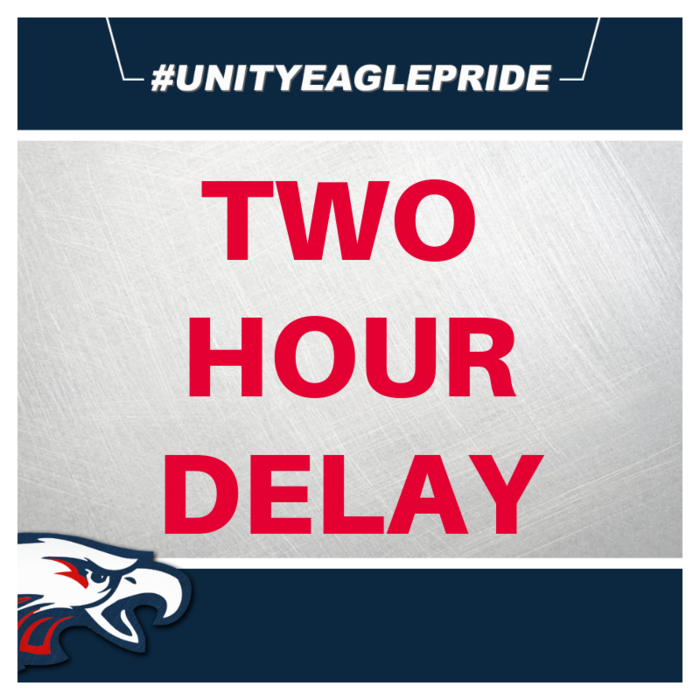 Unity School District is on a 2 HR Delay today, Monday, January 28th. Come cheer on our Unity Eagle Wrestlers tonight vs. Turtle Lake/Clayton @ Unity!!! Match starts at 7pm!! 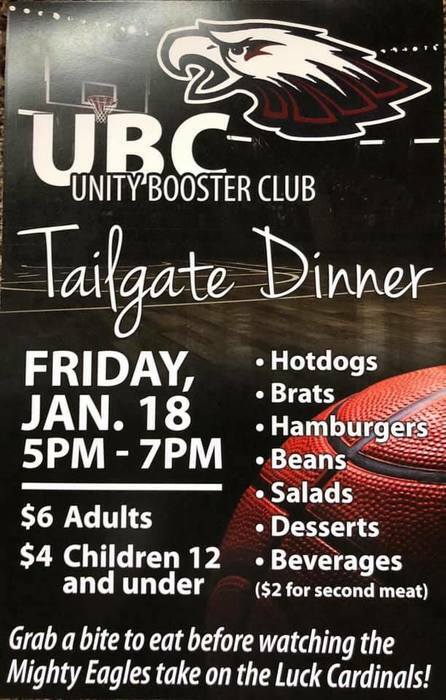 Don't forget to stop by and fill up on Brats, Burgers, and Beans at the Unity Eagle Booster Club Tailgate Party tomorrow night before the boys basketball game vs. Luck! Food will be served from 5-7 pm! Happening Tonight in the Unity Performing Arts Center, District Honors Band @ 6:30pm! The community is welcome to come enjoy music from our area's talented students! Mark your calendars for the next Unity Community Presentation, "SAM: Stop Abusive Messaging". January 30, 7pm in the PAC. https://docs.google.com/forms/d/e/1FAIpQLScFpFRq-WRN-TN_hbNNha3DrLS10rLD1-JTDPytDwsKMJvmIQ/viewform?vc=0&c=0&w=1 Please Take a moment to complete this short survey for our UCLC After School Program. Open to the Public Tonight! QPR Suicide Prevention Presentation at 7pm in the Unity Performing Arts Center. Join us for our Veteran's Day Program this morning at 10:30 in the Performing Arts Center. 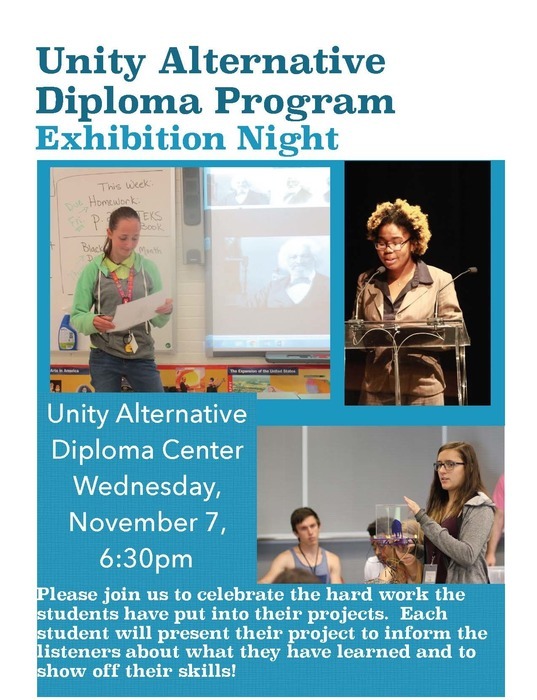 ADP Exhibition Night is tonight at our Alternative Diploma Center located in the newly remodeled WITC - Balsam Lake. Stop by and see the great things our students are doing! Join us at the Unity Halloween Party tonight from 5pm - 7pm. Games, movies, and treats! Don't forget to sign up for the "Witches Call" for your chance to win some great prizes!! 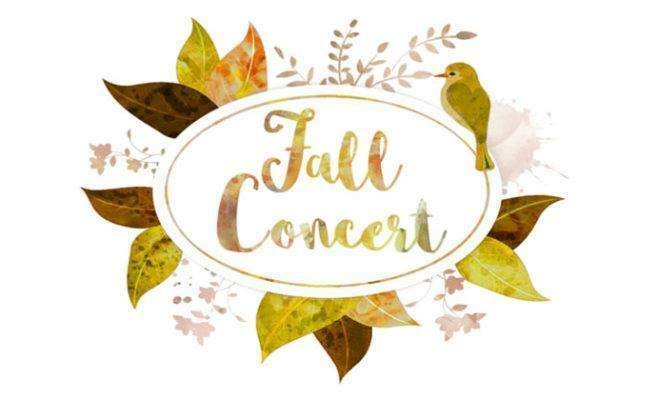 Fall Concert tonight at 7 PM! Unity School District Annual Meeting Tonight at 7pm in the Elementary School Cafeteria. Second round of Regional Volleyball tonight @ SCF...7pm. Come cheer on the Eagles! Regional Volleyball...Tonight vs. Webster...7pm Go Eagles!!! It is Regional playoff week at Unity!! 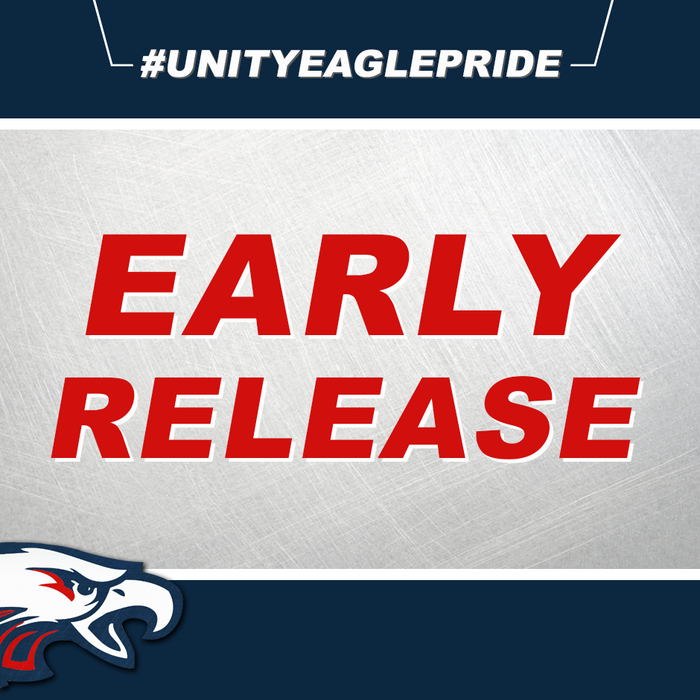 *Tuesday - Volleyball vs. Webster @ Unity 7pm *Thursday - Soccer vs. Hayward @Unity 4pm *Friday - Football vs. Webster @Unity 7pm *Saturday - Cross Country @ Iron River 1pm Good luck to all our Unity Eagles! 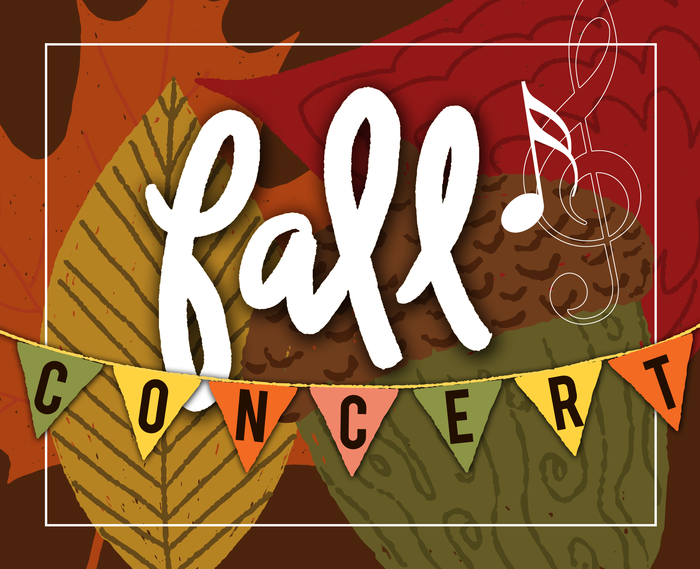 Don't miss the High School Fall Concert! October 23rd from 7-9 PM in the PAC.